Stress. It's something we all live with, whether we punch a clock, are the owner of said clock or trying to build a clock. But how you deal with this stress will determine how well you perform. So what if there was a drink that actually relaxed you and helped you focus without any debilitating effects? Sounds promising, right? That's the sales pitch of Just Chill, a line of sparkling beverages created six years ago to help combat the daily stresses in our life. 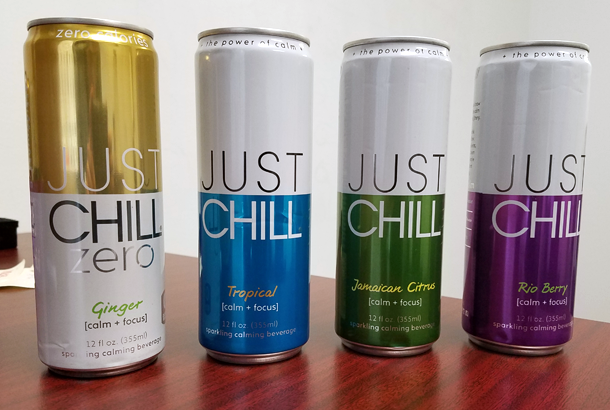 "In a world run by caffeine giants, [creator and CEO Max Baumann] hopes to prove to consumers that you perform at your best when cool and calm, not overstimulated and jittery," says Just Chill spokesperson Alicia Manzur. The drink's origin story is relatable, too. Baumann found himself where no one would ever want to be: Los Angeles International Airport. Baumann looked around and saw angry drivers and people stuck on lines to get on flying metal tubes. In the sea of stressed out travelers, this is when he apparently came up with the idea to develop a drink to keep people calm and focused. Business has been good for three-year-old The Chill Group, according to Manzur. Although as a private company, it won't reveal full financial details, Just Chill has an annual yearly revenue of more than seven figures and grew more than 300 percent from 2014 to 2015 and more than 80 percent from 2015 to 2016. So how does this magical beverage -- available nationwide at The Vitamin Shoppe, many regional Whole Foods Markets and other select stores -- actually calm its user? Just Chill's proprietary ingredient, Suntheanine, a patented version of L-theanine, an amino acid found in green tea. The science is not settled on L-theanine, but studies have suggested it alters brain chemistry to help us relax. Related: Too Busy for Your Morning Cup of Joe? Chew on These Caffeinated Cubes Instead. 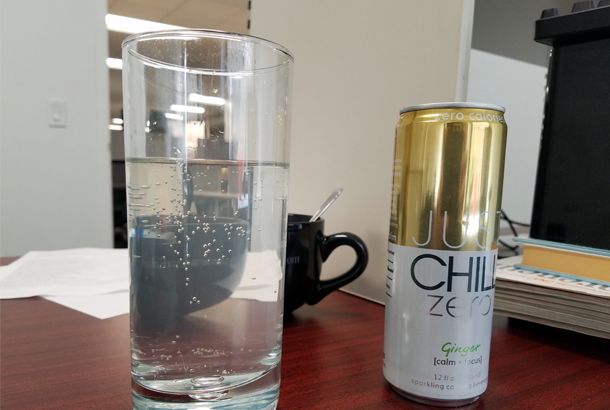 I drank Just Chill's sugar-free ginger-flavored drink on three separate occasions -- including one right before writing this article -- and can say that I did feel relaxed. The effect of the soda -- which tasted like a subdued ginger ale -- isn't earth shaking, but things felt slightly slower and stressors seem a bit more tolerable. Carly Okyle, editorial assistant: I tried the tropical flavor and the berry flavor. The tropical one tastes better; it's lighter and more refreshing. The berry one is more cloying. As far as its effect on mood, I think it did make me feel a bit calmer. I was still stressed and anxious about stuff, but I felt almost a bit removed, so that I didn't have the heart-pounding and muscle tensing I usually do. The placebo effect is a possibility here. Deepa Shah, director of innovation: It tastes like watered down ginger ale, not bad though. I bet this is even better over ice. It does have that sugar-free aftertaste, which you have to just power through. I had a green tea, per usual, in the a.m. to kick off my day with some peace and energy. I had the Just Chill Zero around noonish and went into a mass of Monday conference calls. Usually, after a barrage of calls I'm stressed by figuring out which task to tackle next. This time, I felt relaxed, not stressed. Either my calls were easy or Just Chill works. Or it's a placebo effect. Either way, I'm pretty chill for a Monday at 2 p.m. I can't say I'm all that focused on work or tasks, but I'm focused on lunch for sure. Dan Bova, editorial director: I had the Jamaican Citrus one -- tastes pretty good! Like not-too-sweet ginger ale. Had a little bit of a chalky, vitamin aftertaste but not horrible. It was refreshing, not grossly sweet like most sodas. I don't know if it calmed me down, but that might just be because I drink about 300 cups of coffee a day. It didn't make me feel weird or spacey, so at worst, it was a pretty good tasting soda. Justin Koenigsberger, publisher: I’m a fan of ginger ale, so the taste didn’t bother me. I guess I was in a calmer state than usual, especially when I’m dealing with the rollercoaster ride of sales. Peter Page, contributed content editor: There is nothing exciting I can say about this beverage, so it lived up to its branding. I consider it amnesia in a can, with a pleasant ginger taste. So there you have it. If you're looking for a little cool me down, Just Chill may just be a quick fix. It's possible the relaxing nature of the beverage can be attributed to a placebo effect, but does it really matter when you're looking for some relief?